Ambiguous Term? This article is about space explorers. 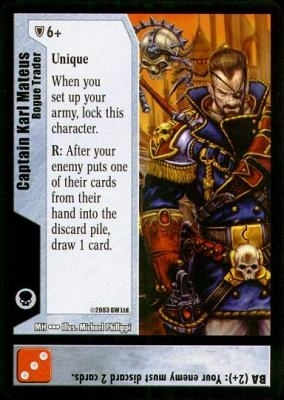 For other uses of Rogue Trader, see Rogue Trader (disambiguation). A Rogue Trader is a combination of freelance explorer, conquistador and merchant. They are Imperial servants, given a ship, a crew, a contingent of marines or Guardsmen and carte blanche to roam the worlds beyond Imperial control. In their task of exploring and exploiting uncharted regions of the galaxy, Rogue Traders might come across worlds harbouring long forgotten human civilisations which will be incorporated into the Imperium. Other times they find empty or alien-dominated planets ripe for colonisation or exploitation. All Rogue Traders are highly exceptional individuals who are driven to success even though these exceptional people often have extreme character quirks themselves; some destroy entire worlds for the slightest reason, or include alien warriors and mutants among their entourage. [1c] Some are highly pious while others are no more than legitimised pirates. One infamous Rogue Trader was Jan van Yastobaal, who became little more than a desperado plundering whatever world he came upon. "I claim this world for the Emperor of Humanity and his Imperium. I bring justice and truth for the loyal. Punishment and death for the guilty." It should be noted that although Rogue Traders are shipmasters who travel the vastness of space, their authority to do so comes not from a Merchant Charter, but rather a letter of appointment that elevates them to the authority equalling Space Marine Chapter Masters, Inquisitors and Planetary Governors[1a] Some of the more ancient ones are dated from the very beginnings of the Imperium, and some were even signed by the Emperor himself. Others were signed by Primarchs or other leaders of the Great Crusade. These charters are very valuable and give its owner great leeway. They are tailor-made and unique. They cannot be re-appealed as according to Imperial law and Imperial religious dogma no one is empowered to overrule these persons. This page was last edited on 15 February 2019, at 13:38.